CHARLOTTE SPLASHES INTO SUMMER | South Charlotte Newcomers! Charlotte is splashing into the lazy, hazy, beautiful days of a Southern summer! A variety of water worlds and water activities are available within the Charlotte area ready to keep the entire family cool! The U.S. Whitewater Center is the world’s largest manmade river! Rafting for all levels and flat-water activities, like kayaking and paddle boarding in the Catawba River, are great ways to involve the entire family in water activities. The Carolina summer breezes are available for landlubbers, including canopy tours, hiking, biking and zip lining. The Great Wolf Lodge has plenty of splash room in its 80,000ft, comfortable 84-degree indoor water park! Approximately 30 minutes from Charlotte, this kid- coveted, magical destination includes thrilling slides for the adventure seekers and a zero-depth entry for the younger children and toddlers. Magiquest for battling dragons and Scoops Kid Spa for an ice cream-themed manicure are available for the water logged. Ray’s Splash Planet is conveniently located in Charlotte’s fun Uptown! Ray’s offers a variety of water activities including the Vortex, a quick-current pool, and a three-story water slide. A lazy river, lap lanes for swimming and water sports round off the fun. Carowind’s is a theme park destination for all thrill seekers! After all the roller coaster turbulence, riders can seek out the refreshing Boomerang Bay! This 60,000-gallon wave pool is for all ages and includes towering water slides and a lazy river. Lake Norman is 520 miles of lake lover’s fun! Rent a boat or Jet Ski and cruise the water! Lake access is readily available, especially convenient through Lake Norman State Park, which allows fishing and a small beach for swimmers. Lake Wylie is a manmade lake that can boast being in North AND South Carolina! 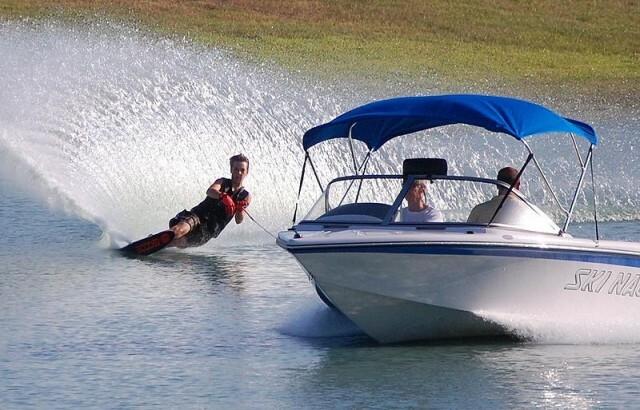 Lake Wylie has 325 miles of shoreline, offering boating, fishing and swimming. Boat rentals are available. Anchor in one of the many coves and enjoy a relaxing time with friends and family! Nothing could be finer than to be in Carolina in the summertime! Enjoy the sunshine and beauty of a Charlotte summer by beating the heat in the many water activities available in the Queen City! BonMaison…..my Favorite people…thanks for the info….and Enjoy the lazy Hazy daze of summer! !